How to fix a shirt which was dyed in the wash by mistake... dye it on purpose! My daughter Kate does her laundry herself now and she found one of the mistakes you can make. She accidentally put a new dark maroon sweatshirt in with her laundry. 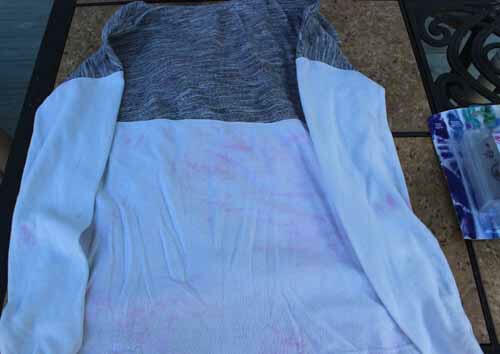 The result was that one of her favorite shirts ended up with pink splotches on the white part. This is the shirt. So, in order to fix it, we decided to try tie-dying it to cover the pink and to give this shirt a new life. This is the finished shirt! Isn't it colorful now? Now this shirt can be worn again. Watch our video tutorial or keep reading to learn more about how we revived the shirt. 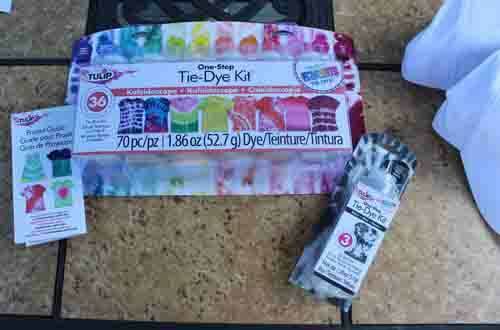 Find links below to purchase supplies for tie-dying from Michaels and have your items shipped or pick up in the store. If you purchase through our links, we get a small commission and you help us to keep making more fun craft videos! Click to watch the How to fix a shirt which was dyed in the wash by mistake... dye it on purpose! video in Youtube. In order to "fix" the shirt by tie-dying, we purchased a tie-dye kit. Kate decided to use the sunburst method for the main body of the shirt and stripes for the arms. Below we have the instructions for tie-dying. * Shirt which was mistakenly dyed in the wash.
* Plastic Grocery Bags (for putting the dyed item in to sit for 6-8 hrs. Dye can only be used one day, so if you have a lot of colors, only mix up the colors you plan to use. The instructions say that the dye loses it's intensity over time. You can get refill packets from the manufacturer, but from what I found, they seemed expensive. It seemed to me that it would be less expensive to purchase a new kit. 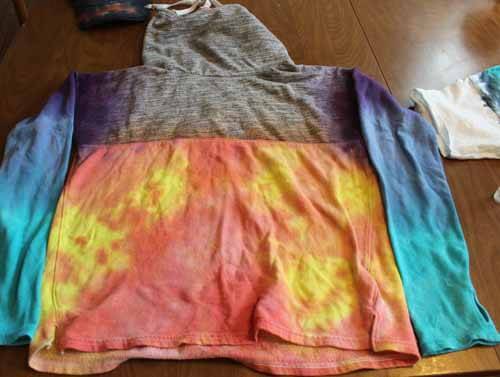 We recommend you plan to tie-dye several items in the same session to get the best use out of your dye. The instructions say to pre-wash the fabric, but we did not wash ours first and we got nice results. 3. Wrap in plastic wrap or place in a plastic bag for 6 - 8 hrs. You want it to stay damp. We left ours for a little over 8 hours. If you want more intensity of colors than we got, you can try leaving the dye on longer. 4. Rinse under water until the water runs clear. Rinse each item separately and don't let them touch even after they are rinsed. Cut off rubber bands while you are rinsing and keep rinsing until the water runs clear. 5. Wash each item separately in your washing machine using the large load setting and a small amount of soap. I also had Color Catcher sheets and I put one or two of those in to catch the color. Dry in your dryer or hang to dry. 6. Wash and dry tie-dyed items separately for the first few washes. To dye using the sunburst pattern, use the rubber bands in the kit and then pinch and bind the fabric. Make each bind several inches apart. For the stripes on the arms, just bind the arms into sections. 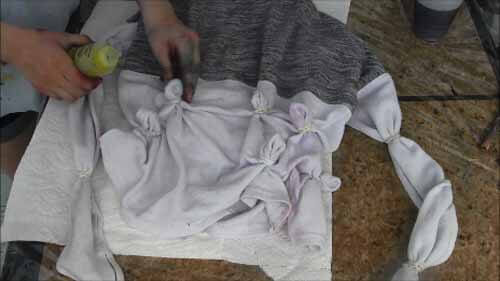 Apply the dye to the tips of each of the pinched fabric. 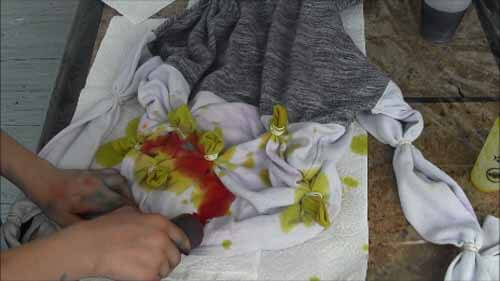 Then apply dye to the body of the shirt. Also apply dye to the sections of the shirt arms. We think the finished shirt came out pretty! The only thing I may have done different is to actually purposefully dye the grey part of the shirt also. It's very hard to keep the color from bleeding into the non-dyed section. If we had bound the top of the arms with rubber bands, it may not have bled as much though. 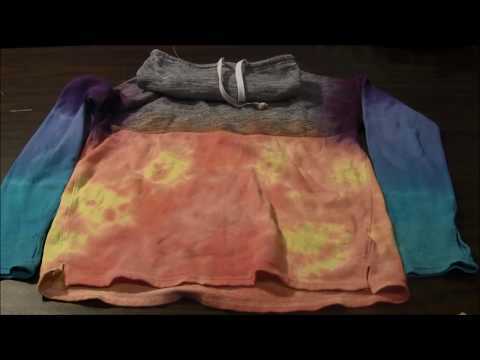 Click Here to watch our other video about tie-dying t-shirts, hats and other items! 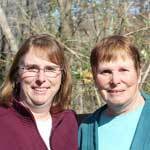 Below are some links to purchase supplies for this project. Remember that if you purchase supplies from our links, we get a small commission and you help us to keep making more videos and tutorials like this one. Thank you for your purchase!